The desire to go fast seems to run in families over multiple generations — Unser, Petty, Earnhardt, Andretti, Allison, Mears, Waltrip, Labonte and Busch, for example. And now an 18-year-old Susanville woman — a third generation driver who recently earned Rookie of the Year honors at Chico’s Silver Dollar Speedway — is the family’s latest speedster making a name for herself on the track. Chelsea Blevins — the daughter of Greg Blevins and the granddaughter of Doc Blevins — drives No. 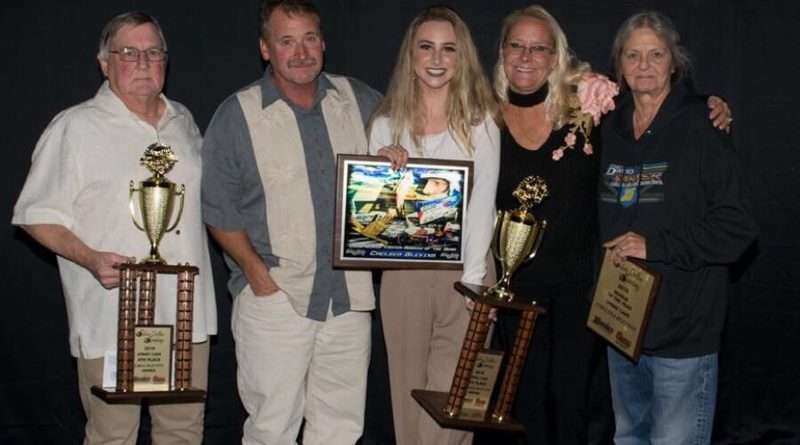 1B, an indigo sprint car with pink trim, and the young racer finished fourth in the points standings to claim the David Tarter Memorial Rookie of the Year Award in the 360 Sprint Car division last August. While the men on the track out number the women, Blevins drives hard to shatter the gender stereotypes on the track. Blevins is proud of her rookie of the year honors. Blevins has been racing and competing since she was 9 years old, getting her start in go-karts. At the age of 14, she started driving sprint cars. This year Blevins hopes to jump up into the American Sprint Car Series that, according to the Lucas Oil website, brings the best of sprint car racing to dozens of tracks throughout the U.S. and Canada and maybe even wind up driving a sponsored car. Blevins said the tour features about 40 races from California to Florida. At some of the big races, a first place purse can be as much as $50,000, Blevins said. And she knows what it’s like to get injured in a big crash. Last year a crash at Petaluma left her with internal bleeding, a torn spleen, a concussion and three cracked ribs. She spent three days in intensive care and made a full recovery but missed months of racing. In addition to going fast, Blevins said one of her talents is being able to figure out what’s going on with the car as it roars around the track.